Coding has always been like a foreign language to me. (Come to think of it, so has English.) However, coding appears to be the language of the future for techies-to-be. 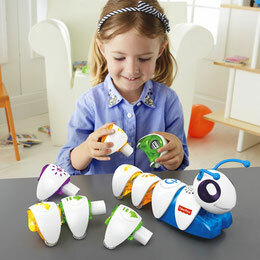 So, Fisher-Price has developed a learning toy, Code-a pillar™, that allows youngsters to arrange and re-arrange segments of a cute plastic critter's body to produce an endless array of moving and flashing light combinations. FP says: "This learning toy encourages experimentation while developing important skills like problem solving, planning & sequencing and critical thinking." Where were you when I was 5? Maybe I could've skipped first grade.